Fluidity was recently released on WiiWare in North America and we were very impressed with the game's unique approach and fluid execution. With the game making its debut today on the European WiiWare service under its new moniker Hydroventure , we thought it might be a good time to sit down with developer Curve Studios to find out a little bit more about the rather unique physics-based adventure. Jonathan Biddle (affectionately known as Bidds to his friends), the Design Director at Curve Studios and director of Fluidity/Hydroventure, was kind enough to take time out of his busy schedule to answer a few of our questions. You can find out what he had to say to us in the exclusive Nintendo Life interview below. Nintendo Life: Can you tell us a little bit about Curve Studios and what key games you have worked on in the past? Bidds: Curve Studios was formed in 2005 by a number of industry veterans with the express intention of working on smaller games, such as digital download and handheld. We’d been through the mill on larger, big-budget titles many times before and decided that, with Curve, we’d like to instead create something that was small and perfectly formed. We’re best known for our work on Sony’s Buzz! franchise on PSP, and while we’re proud of those games, it’s not really representational of who we are as a developer. We’re very creatively-driven, working hard on making inventive video games with a lot of heart. Although players are only now getting their hands on our first original titles, we’ve been slaving away over these for years; we created the Fluidity concept in 2006, and started development in 2008. Explodemon was first started in 2005. NL: As an established PlayStation developer, why did you decide to develop a game for WiiWare? Bidds: We’ve always been platform-agnostic as a developer. We create original ideas and then target them towards the platform that we’re developing them for. 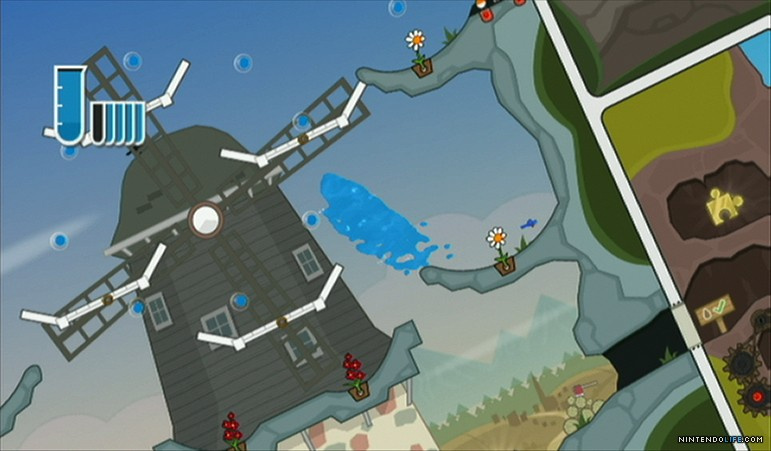 The idea for a water game first came up in 2005, but it wasn’t until we saw the Wii Remote that it really took shape. We knew that tilting a controller and having water react on-screen exactly as it would in real life would create an immediate and intuitive interface that people wouldn’t need explaining to them. It was at this point that we knew we had a great WiiWare title. NL: Nintendo published your game on WiiWare - how did this come about? Bidds: We met up with our eventual Nintendo producers, Masa Miyazaki and Azusa Tajima, at GDC in 2008 and pitched a couple of ideas to them, including Fluidity. After listening patiently, they were very complimentary and said that we’d pitched some really fresh ideas. They got back shortly after to say that they liked to go forward with an experiment with Fluidity. NL: In North America we know your game as Fluidity, but this was changed to Hydroventure for Europe. What were the reasons behind the name change? Bidds: This was simply for legal reasons. 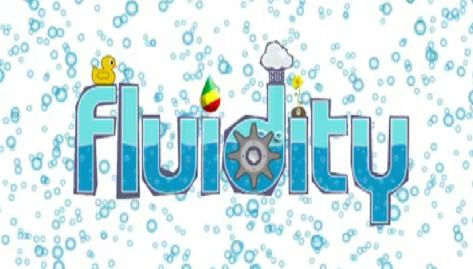 Fluidity didn’t pass Nintendo’s legal and trademark checks in Europe. NL: How did you come up with the game concept for Fluidity? 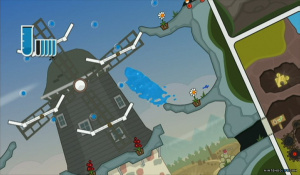 Bidds: The idea of making a game based on water was originally discussed in 2005. Water is so universal; it’s used by everyone in all walks of life every day, and always in a positive way. We have fun in it, clean ourselves with it, drink it, cook with it, it’s even a part of our weather and strongly associated with life and the planet. We all learn about water’s basic properties in science class at school too. The basics of freezing water to make ice and boiling it to make steam are things that no one needs explaining to them. 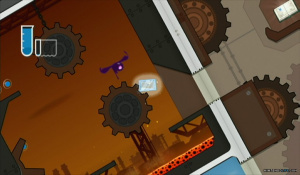 We thought that all of these elements could be brought together to make a great game with really unique mechanics, and when we saw the Wii Remote, we instantly saw how it could be done. NL: What difficulties did you face in developing a physics-based game, particularly with water which is notoriously tough to replicate? 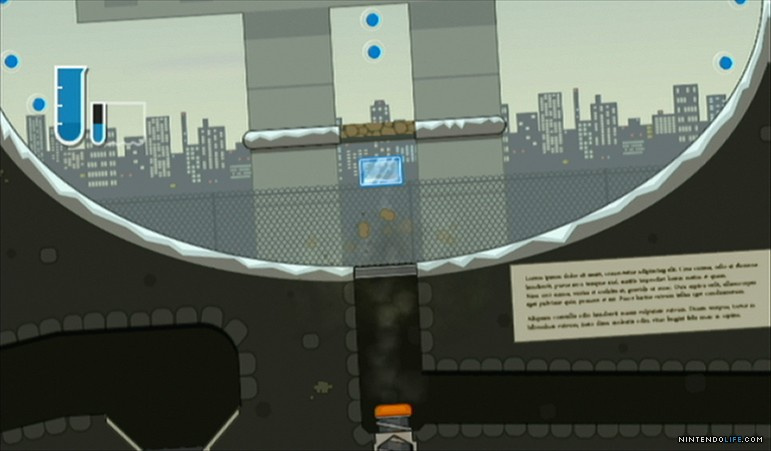 Bidds: The game’s physics system was built organically over the course of the game. We started by creating the water physics and then layered the other elements over the top, for example, adding objects that the water could carry and making them interact with the world. As the game developed we added motors, joints, and the other elements, each time ensuring that they worked with what we had. This meant that the gameplay never outpaced the technology, instead growing together and supporting each other. Working with water as a main character was incredibly hard, however. In most video games, players control a single character that can only be in one place at once. 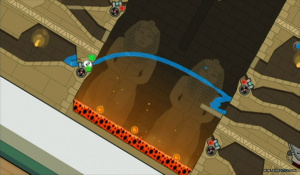 The typical things that you use to control a game’s level design – such as triggers, switches, enemy AI – normally rely on a single player position. This was thrown out of the window for Fluidity, since the player could be in hundreds of places at once. We had to devise a system that catered for this in all circumstances, which took a lot of time to get right. NL: The controls handle very well for both newcomers and seasoned players. How did ensure the game handled well for everyone? 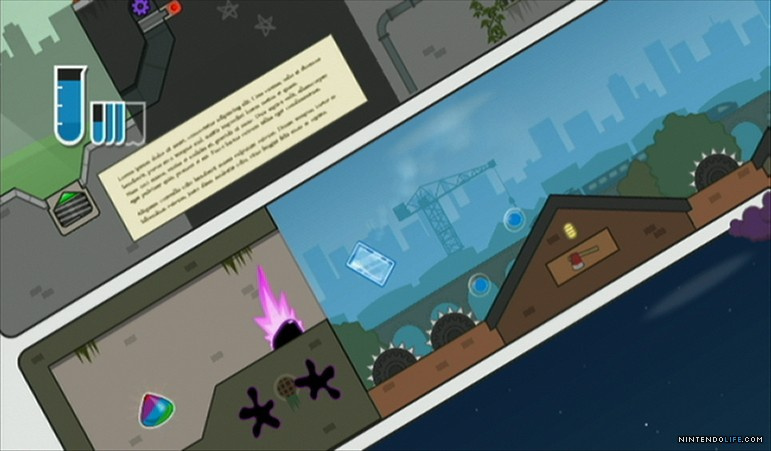 Bidds: The original concept we had for the game’s controls – tilt to move and lift to jump – went in from the beginning and just worked really well. 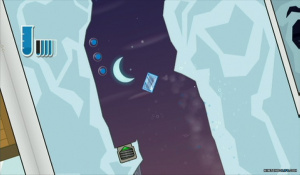 However, because of the game’s water, we had to do a lot of work on the jump. Normally in a game, you let a character jump once and then not jump again until they have landed on the floor. This isn’t possible with water, since we can’t tell when the water has hit the ground, since it’s not a single entity - some of it might have, while some of it might not. The concept of the water being on the ground just doesn’t exist. 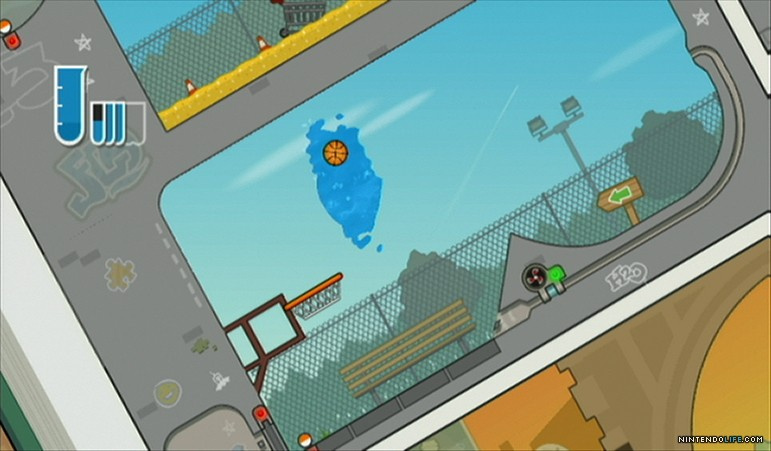 Instead we allowed the player to jump whenever they wanted by lifting the world, even if they were in mid-air. We had to put a delay in after this however - otherwise they could repeatedly jump the water up and up, until it flew up into the sky! We matched this style of jump control with level design to ensure that it worked well with the kind of challenges we were setting. We thought about putting the jump onto a button press but, aside from not having any buttons left, it didn’t make any sense, nor feel right. Something was lost when the tactile, physical interface was removed. In Fluidity, you’re not making a character jump, but instead interacting with the world in a physical manner. We focused on ensuring that the jump worked well when instigated correctly and we’ve found that – once players have got used to the lifting action and the kind of game Fluidity actually is – it works perfectly. We do have some tips to share though. During play testing, we noticed players holding the Wii Remote in certain positions that made it more difficult for them. 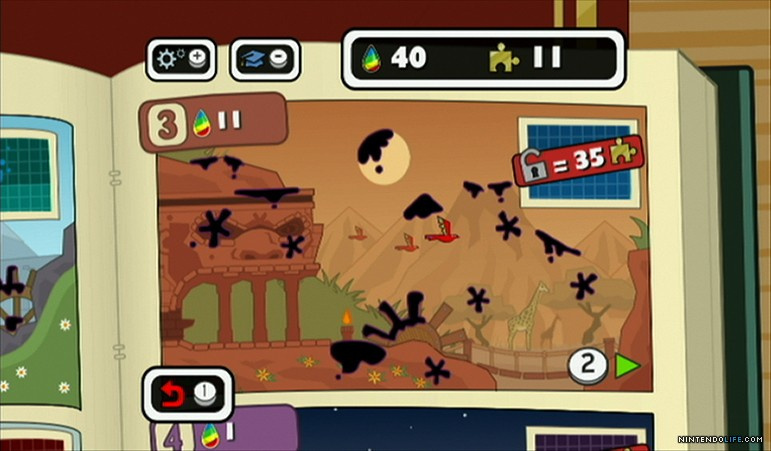 In order to get the best out of the game, players should not tilt the Wii Remote past the vertical position, since the game doesn’t recognise angles past that point. While jumping, they should lift the Wii Remote perpendicular to its upwards face, not trying to ‘scoop’ it around corners, for example. 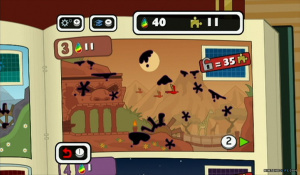 Also, players should ensure that the Wii Remote is facing upwards, in the position shown in the opening image of the game. If you follow these tips, you’ll get a perfect control experience. Interestingly, we did a lot of user testing, and found that the difference between those who played games a lot and those who didn’t wasn’t as profound as you’d normally find. We put this down to the intuitive interface and also because there hadn’t been a game about water before, so effectively everyone was a beginner. 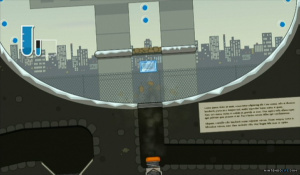 NL: Very few WiiWare titles features the degree of polish found in Fluidity. How were you able to squeeze so much detail and variety into such a small file size restriction? Bidds: One of the benefits of having Nintendo as a publisher is that they commit to delivering a very polished game. They always pushed us just that bit further than we were used to, and were very supportive in helping us make the game everything it could be. Nintendo also really understands video games. They were always on hand to offer advice or a different way of looking at things, and we were able to collaborate really effectively on all development issues across the course of the game’s creation. It really was a great development experience working with Nintendo, and I think it shows in how well executed Fluidity is. NL: There would seem to be a lot of ideas left to explore with the gameplay scheme you've created. Any chance we'll see a sequel? Bidds: Fluidity was, for us, a big, enjoyable gameplay experiment. We pushed the concept in so many directions, trying out lots of ideas and gradually refining it until we found the sweet spot. Now that we’ve got a magic formula, we feel that there are lots of ways we can improve and build on it. Of course, given that Nintendo is the publisher, it’s really down to them. I’m sure some great sales and positive comments from the game’s fans would really help! NL: Given the tilt function of the upcoming 3DS system, do you think Fluidity would be a good fit for the system? Bidds: We’re really excited for the 3DS - we were totally blown away when we saw the 3D effect in action. It’s clearly going to be an outstanding system, so we’d love to be able to bring Fluidity to it. The gyro sensors in the 3DS would mean that our control scheme would carry across unchanged, so we do feel that it would work well. It’s up to Nintendo whether that becomes a reality though! NL: The visuals are probably the most stand-out aspect of the game. What prompted the mix of detailed elements on abstract-like backdrops? Bidds: The visual style of the game changed hugely from its initial concept. We originally wanted the game to look like an airline safety card that had come to life. When development started, we took this further when we began looking towards an educational presentational style, so that players would be learning about water and all of its properties by reading a futuristic interactive book. The book concept remained throughout development, but we found the educational style too plain and dry, so we evolved the style to become much more colourful and friendly. 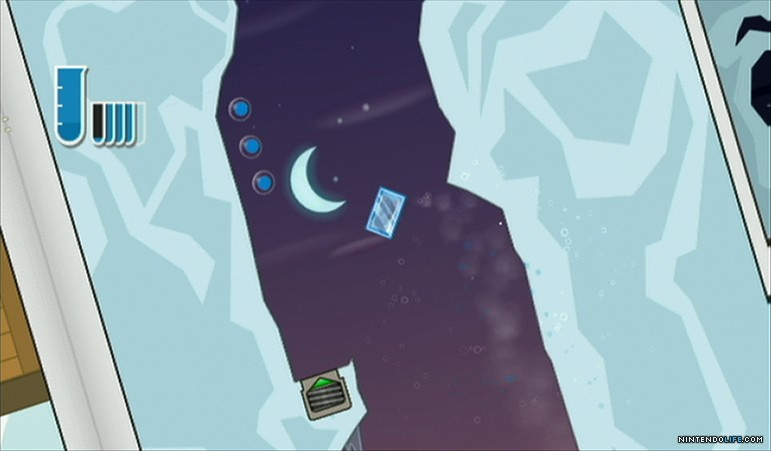 Since it is essential that the game objects can be seen at all times, they were designed to pop out of the background, but because our setting had morphed to become a magical illustrated book, the backdrops could be anything we wanted. This was empowering for the artists who were able to take each panel of the page – of which there are over a hundred – and give each its own individual personality. We think it’s created a really unique aesthetic that we’re very proud of. 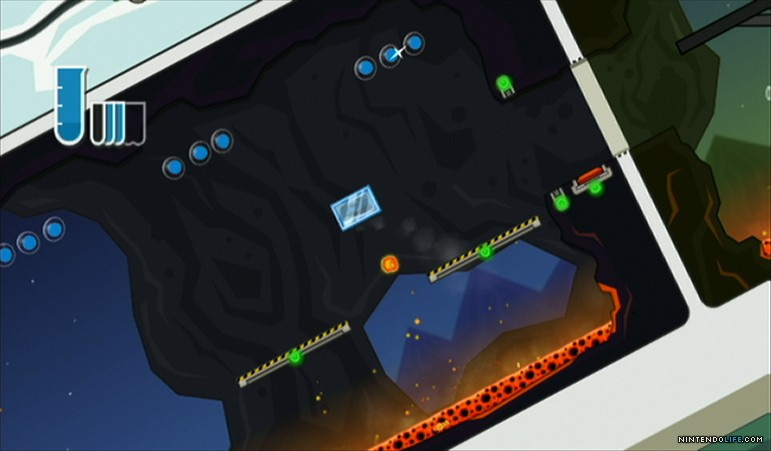 NL: Back in April 2009 we reported that you guys were going to bring Explodemon to WiiWare - why did you decide to switch over to PSN in the end? Bidds: Because we were self-funding Explodemon, we were only able to focus on one platform at a time. We’d always planned to lead with Explodemon on PS3 so when we came to look at other versions we had to look at the cost involved. Since any assets that were used for the HD version of the game would have to be recreated for the Wii version, and the engine rewritten to cater to the Wii’s processor, we simply didn’t have the money to do it. It is something that we’d still like to do though. We love the Wii and have had a great experience with WiiWare through Nintendo. We think the game fits the service and the console well, and we know there are people who want it. We’ll just have to see what the future holds! NL: Did you have problems with Explodemon being confused with Twisted Pixel's 'Splosion Man? What's the story there? Bidds: There is quite a story to tell there. Explodemon is our oldest concept. I started it in my spare time as a 2D sprite game for PC in November 2005, just for laughs. As the game became more developed and it was clear that people found it really enjoyable, many friends and colleagues (and publishers!) started to take interest. We decided that it should become a proper Curve project and started to pitch the game to publishers. To cut a long story short, we managed to get slots on PSN and XBLA for the game in April 2008. Unfortunately, at the same time we lost our funding, and so were unable to start development. We tried to get the game going many times that year, but in October 2008, Microsoft took away our XBLA slot due to our inability to progress. We continued to develop the game, but more slowly because we still had very little money. On 1st April 2009, our pitch trailer was discovered and word of our game spread. We got lots of really great comments, which was enormously encouraging for us! Later that same day Twisted Pixel released their first press release for Splosion Man. 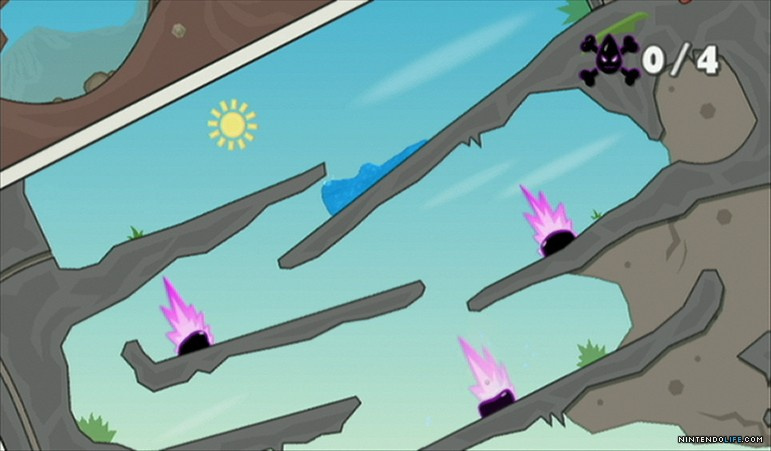 We did eventually begin full development of Explodemon for PS3 in November 2009. We believed in the game so much, and knew that we had something really fun, so we simply wouldn’t give up! We’re now finally preparing for release. However, we’re finding that there are a lot of people who aren’t aware of our history and the things we’ve been through, and so we’re subject to repeated accusations of creating a Splosion Man rip-off. As you can imagine, this is pretty frustrating for us, since Explodemon’s core gameplay hasn’t really changed since 2006! For the record, I’ve never played Splosion Man, so I can’t comment on how similar it is, but from what I’ve heard the games are very different in style and gameplay. All I know is that the same care and attention that we put into Fluidity is also present in Explodemon. We know video games, and we care a lot about making them right. We’ve got some very deep and well-considered gameplay that has been honed in the many years since the prototype was first created. Now we’re just looking forward to people getting their hands on Explodemon so that they can see that it’s very much its own game, really quite unique and extremely enjoyable. The story of Explodemon’s genesis and release is long and interesting. If your readers would like to hear the full tale, they can read the Explodemon Saga at my blog, http://www.onebitbeyond.com. Bidds: Regarding Fluidity, we’re really happy to see a lot of players who’ve dived right in and really got it, really enjoyed what we’ve created. I’ve not seen anyone who bought the game complain about it, which is great! I think that there’s a bit of prejudgement that goes on these days amongst ‘core’ gamers when it comes to motion controls, and some people presume that Fluidity will suffer from this. You’ll find that the game’s control method suits the game better than any traditional system ever could, because it’s been designed for the Wii Remote from the start and tuned right up to the very last moment. Try the demo, it’ll win you over! We'd like to thank Jonathan Biddle for taking the time to do the interview with us. Nice. I haven't tried anything else from this developer, but I did like the demo of this game. I hope to see more WW releases from them. This game is great! (Just tried demo) There's also a 9-minute video interview with Curve Studios guys on the Nintendo Channel (EU). Just watched the trailer that Nintendo sent out via email. I ended up buying the game shortly after trying the demo. I have to say that I feel great knowing that imaginative thinking hasn't died out this generation. Fluidity (I call it "Water Game" lol) is so much fun to play that I have to say it's among the best games I have bought this year (top 3 of the year for me). Curve Studios has made a new fan and his name is.....classified information, but his username is ItsAD3! It was nice to read a positive WiiWare story after the last two. I really loved the demo and next time I can get my hands on some Wii points Fluidity is my number one priority. Awesome game, one of my favorites of the year. Also I do hope we get Explodemon on WiiWare. played Explodemon on psn and loved it i hope you bring it to the WW and love the Fluidity game demo if i was not so poor i would to download it! Awesome interview guys, very interesting. I loved Fluidity, can't wait to see what else they come up with. Spill?! Groooooan. I thought you guys said you were done with the puns. I hope this truly is the last Fluidity article. I'm tried of all the info on this game coming out in drips. I bought Hydroventure yesterday after playing the demo. At first I wasn't that enthused about it because you have to fiddle around a lot with the controls and always wait to keep the water together. But it's fun once you get used to it. For me, this is one of the true gems on the WiiWare service and worth the 1200 points. It's original and motivating and runs with a smooth framerate. And I don't say that to every game. Am officially a FLUIDITY fan... GENIUSES!!! oh and thank you NintendoLife u guys ROCK! Gaijin Games, Frontier, 2D Boy and now Curve Studios - the 4 reasons why WiiWare has been fundamental to gaming for me this generation. Tiny gems which would not have found traction if forced to make full size disc games due to budget, or game size, but ideas which definitely deserved to be released and have success. I was sold on Hydroventure from the very first trailers, so took the risk and got this without even trying the demo. Amazingly polished and great looking game. I bought it on midnight of 24th as soon as I found out it was up on WiiWare. Only on chapter 1 still, but great so far and I look forward to the later levels. Tried the demo and had to pick up the full game soon afterwards, great game.